Wholesale sharpeners, scissors and more for the office, school or home. Wholesale school scissors especially designed for a child's hand. Extra s﻿trong and durabl..
5" Westcott Jr. Scissors $0.94 Each. This pair of wholesale school scissors are economically priced, well-built tool that comes in handy ..
Dome Sharpeners 3 ct. $0.84 Each. 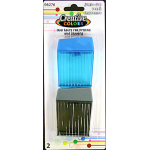 Creative Colors 3 count sharpeners.Case of 48.. Pointed Tip School Scissors $0.39 Each. Perfect school scissors to help create fun art, crafts and school projects. They feature stainless s..
School Dual Sharpener $0.28 Each. ﻿Wholesale school sharpeners in assorted colors from KOOL TOOLZ. Dual Hole Sharpen Pencils..
7" Pointed tip wholesale scissor made out of durable plastic and steel that won't break easy. These ..
8" Pointed Scissors made out of steel and plastic. You can't go wrong with a scissor like this, teac..
KOOL TOOLZ single hole pencil sharpener with shavings catcher. These wholesale school sharpeners hav..
Wholesale jumbo sharpener $0.84 Each. Jumbo school sharpeners in a 2 pack.Sharpen Pencils and Crayons Case of 48..